:: Another Milestone :: Please support hotdoggie! - Dreams are what you wake up from. and let him suffocate in my house? eh... me not so cruel. If I had a dog, I'd get one, pronto! All the best! Thanks dude. You have a hand in it! Woof wof woof-woof wof...woooof wofwofwof woooof! I guess the Her World editor didn't contact you guys? She didn't reply to my email, sigh. time to see an optician. Can it be use on piglet? Can it be use on piglets? the pug-userpic is very cute. do you own a pug? it's one of my favourite breeds along JRT and golden retriever. 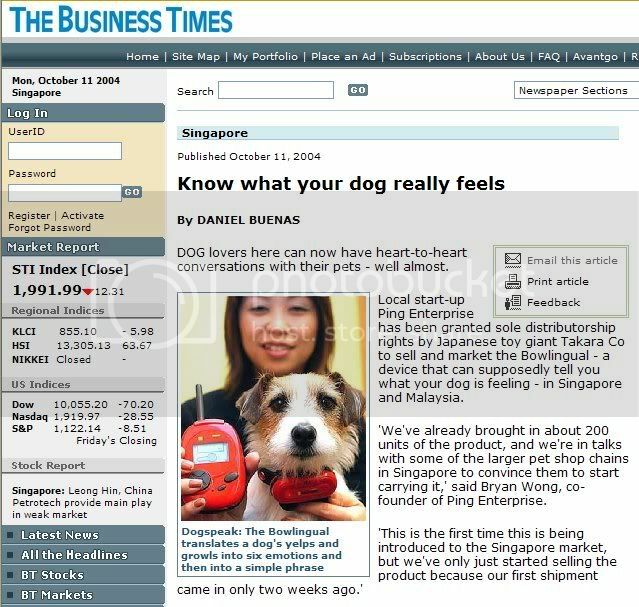 Actually, I don't own a dog in Singapore. This my friend's dog, name's Brumby, he's my God son. hehehe. Very naughty. I have seena very adorable Golden Retriever, but he was slobbering all over. And a very very obedient JRT. i see i see. but pugs are so expensive. and they are prone to breathing problems and tend to put on weight. JRTs' price has dropped in the past couple of years. less expensive than pugs! but tend to develope skin problems. GRs tend to dislocate their hips. is it already in the pet shops? i think it's a lil too big isn't it? hmmm... poor doggie has no more secrets. Guess who's getting one for Christmas? Can you please send 2 to my home? "....This morning when we got down to the main door. It was a great shock! Sunny, we have to chain her in addition to the barrier...."
mebbe next time my mum can get advanced warning if they are in a notti mood again..